Everyone feels apprehensive about hospitalization, especially for a serious disease. For children, this ordeal is even harder: they have a limited understanding of what is happening to them, are afraid of the unknown, afraid of pain, feel anxious, and so on. Children also find it hard to understand that certain treatments can be painful or at least upsetting: surgery, intravenous therapy, etc. Yet rehydration, nutrition, and even chemotherapy are all administered intravenously in hospitals. They require hooking up an IV, which is often frightening, especially to children. To help young patients¹ have a better hospital experience and tolerate their treatment, the Coucou Nous Voilou nonprofit organization created AbracadaBox. This initiative has already been adopted by almost 100 French pediatric wards. AbracadaBox is a plastic box that was specially designed to hold an IV bag. Development prototypes were tested in hospitals, and feedback from healthcare personnel led to significant improvements that incorporate treatment requirements. AbracadaBox complies with CE standards and now combines aesthetics, playfulness, and convenience. Installed on the IV pole, the casing on the back of the box is half open. Nurses can therefore easily access the bag without having to open the entire system. The side facing the child features cartoon characters on a colorful background, hiding the bag and the drip. Technoflex supports this project, and regularly provides infusion bags. Demonstrations in pediatric departments were conducted in real conditions of use. A number of illustrators, such as Zep, Tébo, and Julien Neel, as well as the copyright owners of certain characters contributed their work and gave their agreement. 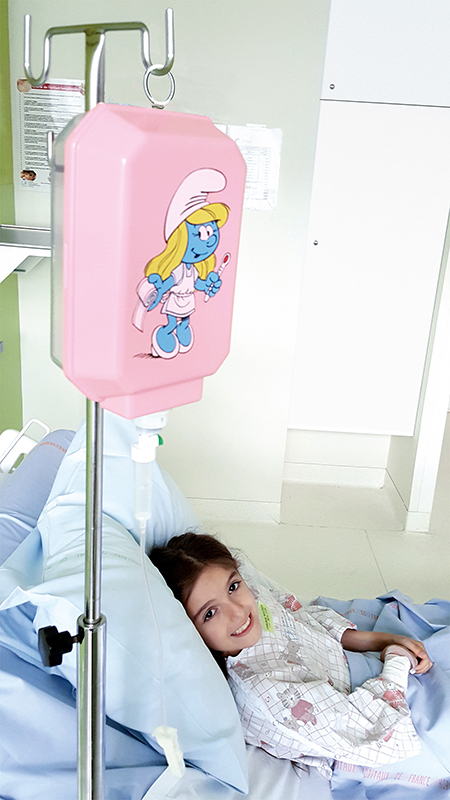 Titeuf, the Smurfs, the Raving Rabbids and many other characters appear on the 3,000 Abracadaboxes that are distributed free-of-charge to pediatric wards in France. These boxes are very popular, as they not only boost the morale of young patients, but also serve an educational purpose. “The healthcare personnel use the cases to help children understand the reasons behind and the need for their treatment. This program is based on the idea that the first step towards healing is to believe in the treatment,” says Marc Salem, founder of Coucou nous Voilou. Enthusiasm for the AbracadaBox shows no sign of abating, and is even crossing borders. Belgium has just received its first cases! ¹Two million children are hospitalized in France each year.